Description: Also known as Chusan Palm. 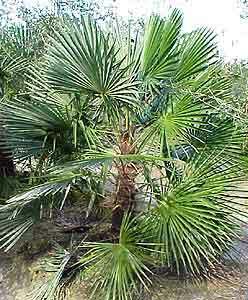 A medium to large lightly armed fan palm that has dark green unevenly divided leaves,split about half way to the petiole. It isn’t self cleaning, so the dead leaves form a skirt around the top of the trunk.